I did a test using AutoCAD’s Sheet Set Manager and clocked the time updating 3 Sheet Properties on 10 different Sheets. I right click on a Sheet and select Properties… and add a Revision, Revision By and Revision Date where they are the same for all the sheets. I paste the date from the clipboard to speed things up. Still it takes around 10 seconds per Sheet to do this and I can imagine users that might need 20 seconds for this. Here are three of the Sheet Custom Properties seen. Imagine an engineer costs 35 EUR per hour updating 300 sheets would costs around 30 EUR. Now there is a time and money saver available. With SSMPropEditor you can do the same thing on 10 or even 1000 sheets in the same time it takes to update only a couple of sheets with SSM. SSMPropEditor is sold at 25 EUR or less per license so if you use Sheet Set Manager and need to edit properties across multiple sheets you can easily see how great a deal it is. It is also so much more fun to use SSMPropEditor instead of manually having repeat the same step over and over. You don’t even have to start AutoCAD. You don’t even need AutoCAD to be installed, just access to the Sheet Set DST file. This means anyone can review the drawings with AutoCAD LT or a DWG viewer and then approve or edit the properties right away. When the property values are varying among the sheets you can see *VARIES* as value and it can quickly be edited on all selected sheets with SSMPropEditor. Autodesk, together with Turner Construction Company completed one of the most high-profile building projects of the year – the new Yankee Stadium. Turner used the latest BIM processes and Autodesk Revit-based products and Autodesk’s Navisworks Manage software to streamline workflow and collaboration while allowing their building professionals to effectively gather design data for visualization, simulate scheduling and identify interferences. 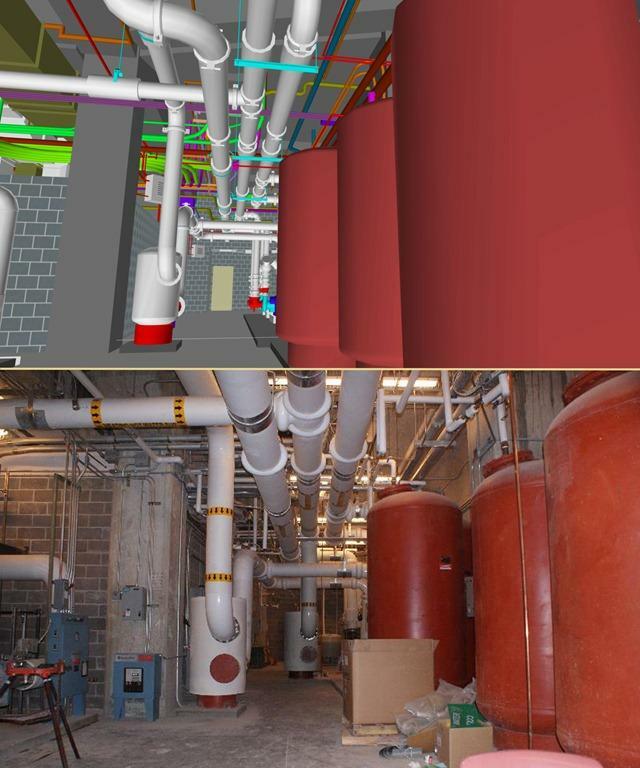 Turner Construction leveraged BIM and Autodesk’s Navisworks Manage software to create 3D models of every major building component – from architectural and structural elements to electrical, plumbing and fire protection systems. Navisworks combined this separate data into a single “virtual” model of the stadium that helped the Turner team and multiple subcontractors coordinate efforts and identify potential costly inconsistencies before breaking ground. 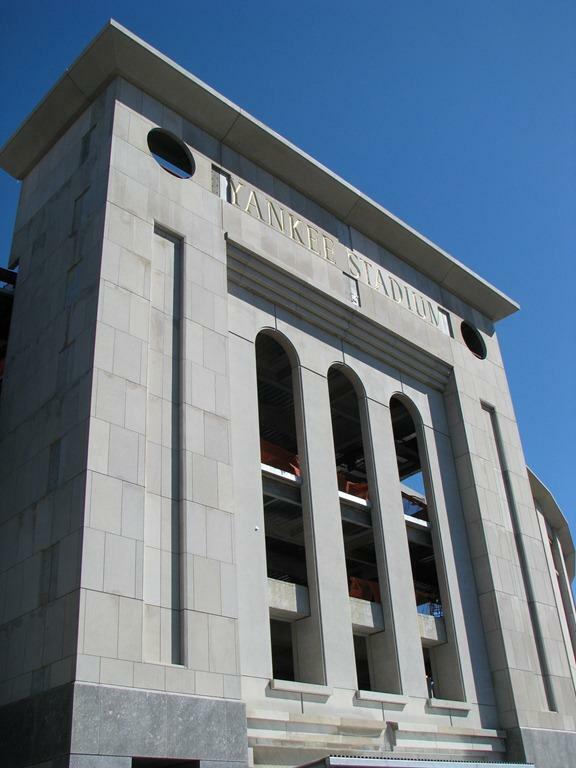 The Indiana limestone exterior, shown at Gate 4, mirrors the exterior of the original Yankee Stadium in 1923. SAN RAFAEL, Calif., June 24, 2009—Autodesk, Inc. (NASDAQ: ADSK), a world leader in 2D and 3D design and engineering software, has announced that Turner Construction Company utilized Autodesk Navisworks Manage software as an element in the Building Information Modeling (BIM) process used to complete the new Yankee Stadium project. 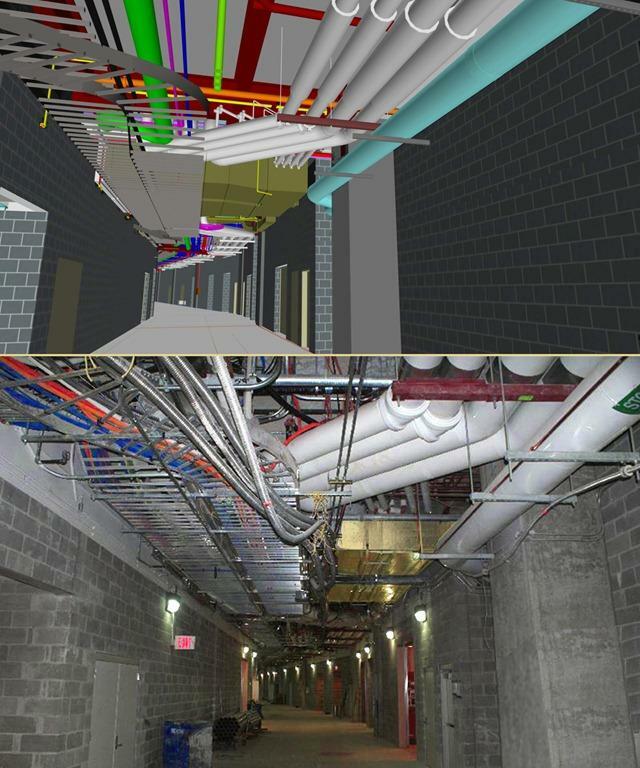 As part of its construction management process, known as Virtual Trade Coordination (VTC), Turner used the latest BIM processes and Autodesk Revit-based products and Navisworks Manage software to help streamline workflow and collaboration among subcontractors. Turner Construction Company effectively applied its experience to foster a results-driven, multi-disciplinary collaboration on the Yankee Stadium project. The company has already managed more than 100 BIM-based projects at an estimated value of $20 billion as well as purchasing and using 400 licenses of Navisworks Manage throughout the firm. 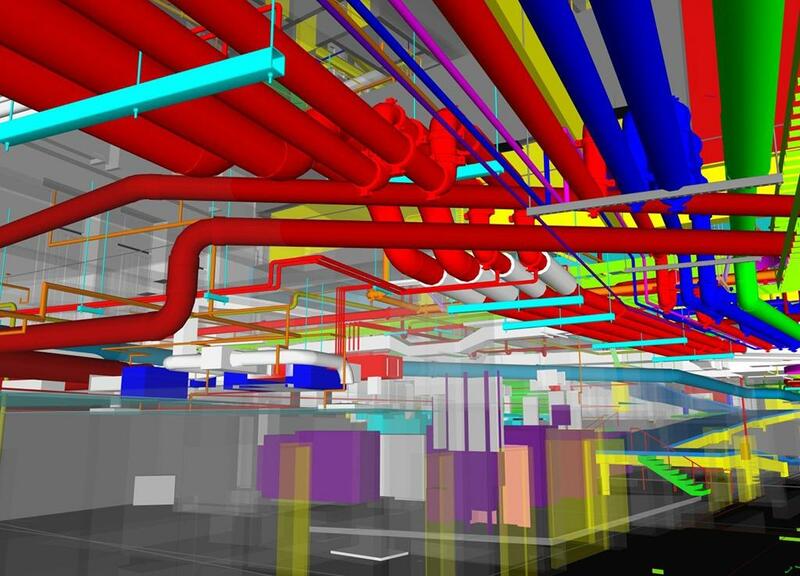 BIM design software was used to create 3D models of every major building component – from architectural and structural elements to HVAC, electrical, plumbing and fire protection systems. With Navisworks Manage software as an essential component of the company’s VTC process, digital data from multiple design and engineering software sources were combined in a single “virtual” model of the stadium that assisted the Turner team and all of the project’s subcontractors in more quickly identifying systems spatial clashes and conflicts to be fixed before the construction phase. This early, coordinated, real-time, whole-project review and analysis helped to minimize costly changes and unexpected scheduling delays in the field. Navisworks Manage software enhances the review process by enabling design and construction management professionals to aggregate existing design data for visualization, simulate scheduling, and identify interferences to improve productivity and project quality. Design data created in BIM applications such as Autodesk Revit-based products can be combined with geometry and information from other design tools and reviewed in real-time as an entire 3D project. The combination of Navisworks Manage software’s precise fault-finding analysis, interference management, dynamic project schedule simulation, and more photorealistic visualization enables advanced project analysis. In addition, entire project models, of various file sizes and formats, can be published and viewed in NWD and 3D DWF file formats for better team collaboration. BIM is an integrated process that allows architects, engineers and builders to explore a project digitally before it’s built. Coordinated, reliable information is used throughout the process to design innovative projects, accurately visualize appearance for better communication, and simulate real-world performance for better understanding of important characteristics such as cost, scheduling and environmental impact. Turner Construction Company provides construction management services to leading institutions and companies who recognize the value of a partner who works diligently and creatively to find the best possible solutions for each particular project. In 2008, Turner completed in excess of $10 billion of construction on more than 2,000 projects throughout the world. Turner’s use of building information modeling (BIM) helps visualize, quantify, and simulate the construction process to produce higher-quality buildings and exceed their clients’ expectations. Autodesk, AutoCAD, DWF, Navisworks and Revit are registered trademarks or trademarks of Autodesk, Inc., and/or its subsidiaries and/or affiliates in the USA and/or other countries. All other brand names, product names, or trademarks belong to their respective holders. Autodesk reserves the right to alter product offerings and specifications at any time without notice, and is not responsible for typographical or graphical errors that may appear in this document. Yankee Stadium is a stadium located in the The Bronx, a borough of New York City. It serves as the home ballpark for the New York Yankees, replacing the previous Yankee Stadium, built in 1923. Much of the stadium incorporates design elements from the previous Yankee Stadium, paying homage to the Yankees' history. The projected total cost of the stadium is $1.5 billion, making it the most expensive stadium in the world. The exterior was made from 11,000 pieces of Indiana limestone, along with granite and pre-cast concrete. Approximately 51,000 fans can be seated, with a standing room capacity of 52,325. Here is some AutoLISP code that can be used to purge unreferenced images from a drawing and delete and detach all images that are not found. It is prepared to be used together with SmartPurger so multiple drawings can be processed. Download the code here, extract the zip file and rename the file from having file extension .txt to .scr and load it with SmartPurger in options>settings>general>script/lisp file. An unreferenced image is attached to the drawing but have been erased. A Not Found image is no longer existing in the valid search paths. An Unresolved image cannot be read by AutoCAD. NavisWorks 2010 is preparing for AutoCAD Plant 3D by a new update. I guess that Plant 3D might be released soon then. Not sure yet how to tell the difference between the initial NavisWorks 2010 and this new release when it comes to version number or so. More details in this press release from Autodesk. This hotfix updates licensing files which allow AutoCAD Raster Design 2010 network deployments to be installed with supported standalone AutoCAD applications. This hotfix will not allow a standalone Raster Design 2010 installation to install with network deployments of host applications. This hotfix also addresses instability issues with Raster Design features (i.e. Imanage) when installed with AutoCAD Civil 3D 2010. AutoCAD Automation Tools has been updated to version 2.2 to further make the automation of AutoCAD drawings quicker and easier. No need to do all that boring manual work on a multitude of DWG files one by one. Makes it possible to insert objects to all layouts at once with the AutoIns command. Upgrade is available at no cost for existing customers. AutoCAD 2000 all the way up to AutoCAD 2010 is supported as well as all AutoCAD based verticals. I had this problem with AutoCAD Architecture 2008 that I installed after installing ACA 2009 and ACA 2010 on the same machine. I got this crash message: AutoCAD Error Aborting FATAL ERROR: Unhandled e06d7363h Exception at 75d0b4f4h. (or FATAL ERROR: Unhandled e06d7363h Exception at 75d19617h) I was advised by the automatic CER email to install the service pack but that didn’t help. AdLMInfoPath was empty on the following location and was obviously the reason for the crash. After I deleted AdLMInfoPath I was able to proceed with the activation. Even though the document only talks about 2009 products it seems to affect also 2008 products. On the topic there is also a problem with AutoCAD 2010. Knowledge Base document: AutoCAD 2010 does not start. When you try to start AutoCAD, you briefly see the splash screen and the program does not start. Knowledge Base document also describes how to: Starting AutoCAD® 2010 in Windows® diagnostic mode by enable “FLEXnet Licensing Service” (previously known as “FLEXlm Licensing Service”) instead of as in earlier versions the “Autodesk Licensing Service”. I have not tried if this trick works with other kind of script files but it might work as well. Google Sites can host a bunch of other file types without this trick. Documents, images, music files and so on are accepted. How much storage do I have in Google Sites? But notice that the bandwidth is quite limited and it is not revealed by Google. If you run into the limit your page will even be locked to edit with the message “Bandwidth limited exceeded”. This means you cannot even remove some of the large sized files. A common question is how to show something like SHEET 6 OF 54 in the title block on a sheet drawing when using Sheet Set Manager in AutoCAD or Project Navigator in AutoCAD Architecture or AutoCAD MEP. There is no out-of-the-box functionality for this in SSM. First you need somewhere to save the total number of sheets. Then you need somewhere to save the index for the sheet. One way is to add a Sheet Set Custom Property that holds the total number of sheet and a Sheet Custom Property that holds the sheet index. The Sheet Number property can of course be used for the sheet index. Whenever you add a sheet or want the total sheets to be correct you need to manually update it. The same thing with the sheet index property on each sheet. To have this show up on your sheet you can add the two fields using standard methods like adding TEXT or MTEXT or using a block with an attribute. Then add the fields. Use the Field category SheetSet and use CurrentSheetCustom and CurrentSheetSetCustom field names and select the custom property name you have. To further enhance this you can use SSMPropEditor. Among other functionalities it has you can with the click of a button update your total sheets count with the Paste Sheet count button. Just select the property you want to update and click on the button. If enough users are interested I also could add support for automatically numbering or renumber sheet sets or sheet index values. If you’re interested in this please send me an email and let me know as well as how you create yours. Is it plain numbers like 1,2,3 or is is more complex system? Would you like to index all sheets or just some? Would you like to set a start value for the indexing? Now you know how to solve the problem with Sheet X of Y or Page X of Y showing up on the title block. SSMPropEditor runs outside of AutoCAD but if you want something like sheet indexing update within AutoCAD let me know as this is also possible to automate. Finally DWGdirect.NET is available. DWGdirect.NET is a managed .NET component containing a rich set of tools for working with DWG data. Still no support for 2010 at this point. In addition, you receive the following refactorings. I found a problem with SSMPropEditor that when I select a shortcut to a file with the open dialog box it tried to open the actual shortcut and not the actual file it pointed to that it should follow its way to. DereferenceLinks property is used to get or set a value indicating whether the dialog box returns the location of the file referenced by the shortcut or whether it returns the location of the shortcut (.lnk). But the default is true and still it did not work to dereference the link. I also found that it worked on XP but not on Vista and Windows 7. It didn’t matter if I changed the .NET Framework version from 2.0 to 3.5 either. Here is the code that returns the LNK file instead of the TXT file. The solution that I found after some trial and error was the following. Notice the FileName property change. I made sure to not use the asterisk. I tried this Google group link and got the following result. Something Is Broken on the “Something Is Broken” website. I got the same problem in both Firefox and Chrome as well as Internet Explorer. JTB FlexReport 5.0 is now available. 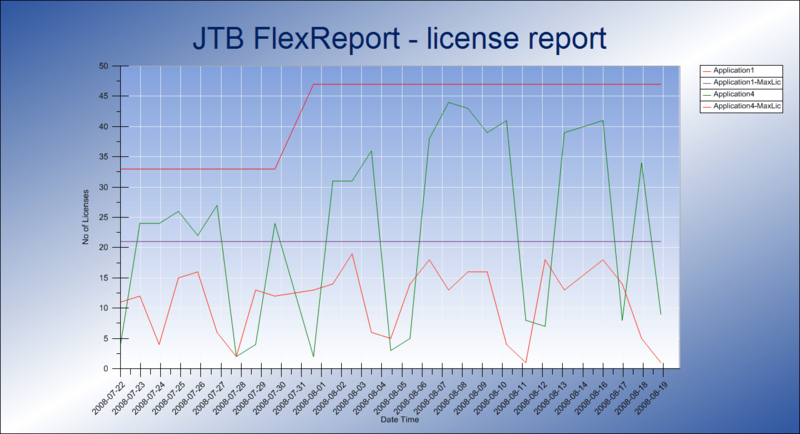 JTB FlexReport is a solution JTB World that helps with reporting on license usage of network licenses like FLEXlm, FLEXnet, IBM LUM and 12D. Included is a completely new chart creation solution made from ground up that is replacing Excel with its limitations. Many different report types can be created with much more flexibility. The report application is prepared for SQL Server support and is a client server solution making it easier to give more decision makers within your network access to generate their own reports. There are many tools available to make it easy for you to adjust the charts according to your needs. Zoom and pan in the chart, inquire about values or change the colors. Here is one of the new types of charts. 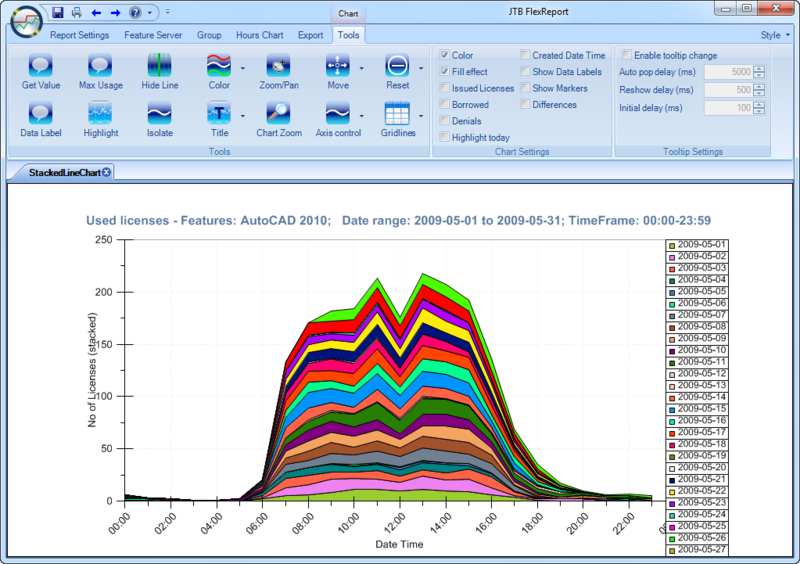 The histogram is useful to determine if you need more or less licenses of a specific feature or application. Contact us to get a free time limited license so you can try JTB FlexReport with full functionality in your own environment. Support for full SQL Server functionality, SPLM, Primavera and more is coming next.